A NEW nighttime Super Special Stage sponsored by Hyundai will bring the thrilling action of the FIA World Rally Championship into the New South Wales city of Coffs Harbour for Coates Hire Rally Australia next 11-14 September. 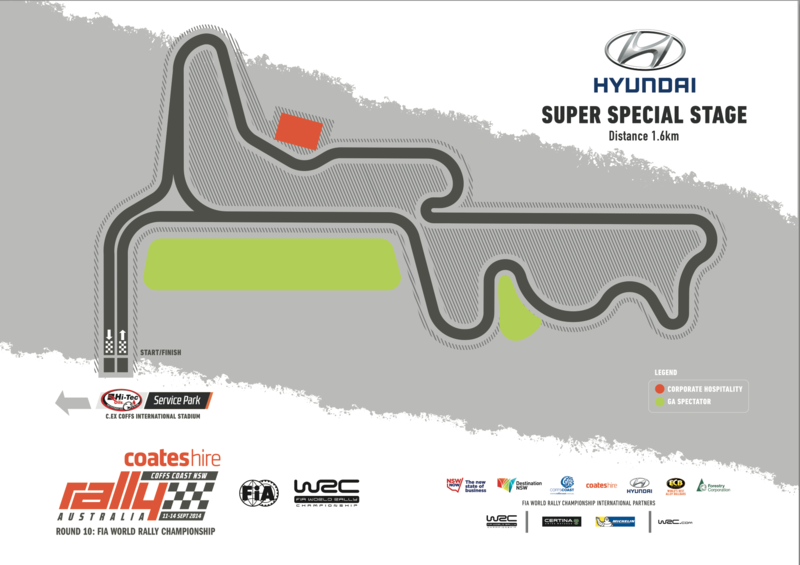 The Hyundai Super Special Stage will be run on a 1.6 kilometre course adjacent to the Hi-Tec Oils Service Park, three kms south of the city centre, rally organisers announced today. It is expected to attract thousands of spectators on the Friday and Saturday nights of the rally to see the world’s best drivers tackle a tight and challenging tarmac and gravel layout in the precincts of the C.ex Coffs International Stadium, incorporating the Coffs Harbour Kart Racing Club. “These will be nights packed with unforgettable entertainment – the Hyundai Super Special Stage will be a must-see highlight of Coates Hire Rally Australia in 2014,” Event Manager David Catchpole said. Mr Catchpole welcomed Hyundai Motor Company Australia as a major new sponsor of Coates Hire Rally Australia. “It’s very exciting to have Hyundai on board not only as an event sponsor, but also as a participant in the WRC with the Hyundai Shell World Rally Team and Australia’s Chris Atkinson as one of its drivers in September,” Mr Catchpole said. “Rally Australia will be a highlight of the sporting calendar in 2014 and we’re genuinely excited about co-sponsoring this fantastic event,” said Hyundai Motor Company Australia Director of Marketing Oliver Mann. Leading Australian driver Adrian Coppin tested the Hyundai Super Special Stage today in his Citroen DS3. “This is going to be real fun for the drivers and spectators,” Coppin said. The Hyundai Super Special Stage will be one of many experiences rally fans can enjoy. The Hi-Tec Oils Service Park at the C.ex Coffs International Stadium in Hogbin Drive, with free public entry throughout the rally, will be alive with constant activity. It will be the base for up to 80 cars contesting the WRC, East Coast Bullbars Australian Rally Championship and supporting events such as the Pedders-sponsored fourth round of the Australian Off Road Championship. Fans will be able to see the cars being serviced and repaired, catch the drivers for autographs, buy souvenirs, watch big-screen stage action, enjoy live entertainment and buy food and drink. The daytime Special Stages will be run on forestry and shire roads in the Coffs Coast region to the north, west and south of the Service Park. Spectator tickets for Coates Hire Rally Australia, including the Hyundai Super Special Stage, will be on sale soon through NRMAtix.